Hello fellow bakers – its been a while! My radio silence is the result of an attempt in our household for some new year healthy eating, and the impending end to my PhD, which has required all my time and energy. However, last weekend I needed a break, I needed a cake, so I decided to bake! When I was a kid, we lived in Germany. I think this was probably where my love of baked goods started. 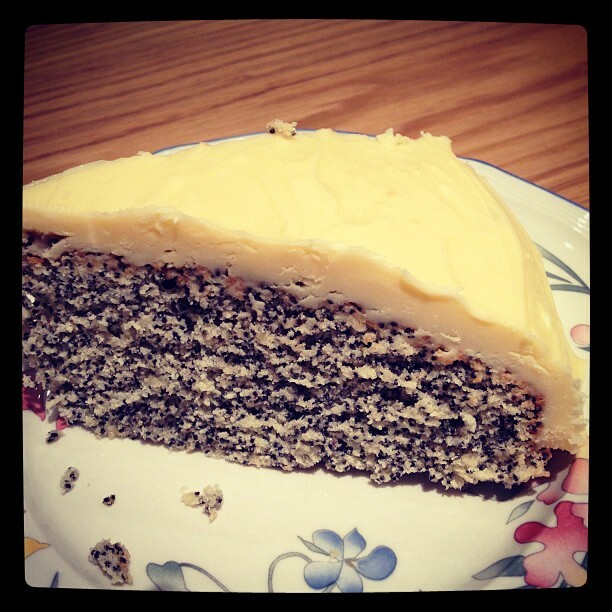 The cakes in Germany are to die for – all decadence and richness – and poppyseed cake is a classic. this is an extra decedent version – from the lovely Bake by Rachel Allen – with a more complicated that usual butter icing that is essentially a custard mixed with butter, but its worth the extra effort. This cake goes a long way because the icing is super rich, but the poppyseeds give the cake itself a lovely almost savoury, nutty taste, which works beautifully with the sweet icing. Just make sure you use a fresh pack of poppyseeds as stale ones would really spoil it. 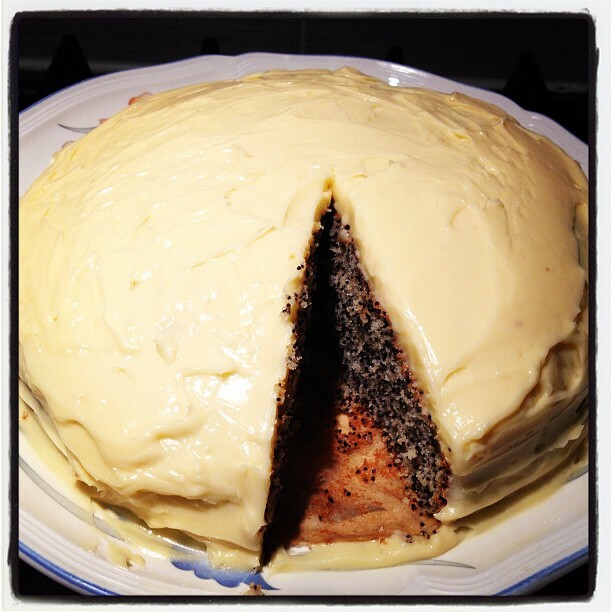 CAKE INGREDIENTS: 150g butter (salted if possible, or add a pinch of salt to the mix), 100g caster sugar, 3 beaten eggs, 100g plain flour, 1tsp baking powder, 75g poppyseeds. Heat the oven to 170 degrees and grease and line a 20cm round cake tin. Firstly, you need to make sure your butter is really soft (I give it a very short blast in the microwave), then cream it with the sugar. Keep going until its light and fluffy – it’ll change colour and go really pale. Keep mixing, and gradually add the eggs – do this really slowly and beat between each addition or it will curdle (although this isn’t the end of the world). Sift the flour and baking powder together, add the poppyseeds and chuck the whole lot in with the butter mixture. Then use a spoon to stir gently all together. Spoon into the tin and flatten out, making a dent in the middle so that the cake rises flat, and bake for 25-30 mins. My cake took 26mins but it depends on your oven. Once out of the oven, leave in the tin for 5 minutes to cool and then remove to a cooling rack. ICING INGREDIENTS: 150ml milk, 100g caster sugar, 2 egg yolks, 175g butter (softened and unsalted), 1 1/2 tsp vanilla extract. Put the milk and sugar in a pan and heat over a medium heat until the sugar is disolved and the milk starts to boil. It should start to thicken a bit and go a bit like syrup. When its reached this stage (5-10 mins) take off the heat and let it cool a bit. In a small bowl whisk the egg yolks and once the milk is cooled a little – so the eggs don’t scramble – pour the milk over the eggs and keep whisking! Return the mixture to the pan and put it on a low heat and keep stirring. Don’t let it boil and keep mixing so it doesn’t stick. Within about 10 minutes you’ll have a thickening custard. Once you’ve reached this stage, pour it into a cold bowl/jug and leave to cool. In a separate bowl beat the butter until smooth and lightened and add in the vanilla. When the custard is at room temperature, add that to the butter and whisk together. When the cake and icing are cooled, spread the icing all over the cake, including down the sides. By covering the whole cake, you’ll find it keeps quite well and stays moist. You should end up with something that looks like this! A very rich and creamy icing, for a slightly nutty cake. Keep the cake in the fridge and it’ll last for about 5 days, although I found it was nice to pop a slice in the microwave for 10 seconds just to warm and soften it up before eating. Give it a try but remember to check your teeth for poppyseeds before going on any dates!